Imagine the world a decade from now. It’s no longer ruled by powerhouse countries such as the US or China, but by a handful of tech corporations that know everything about us; what we need, buy, say, and ultimately what we desire. So join me for a short imaginary trip to our possible future. 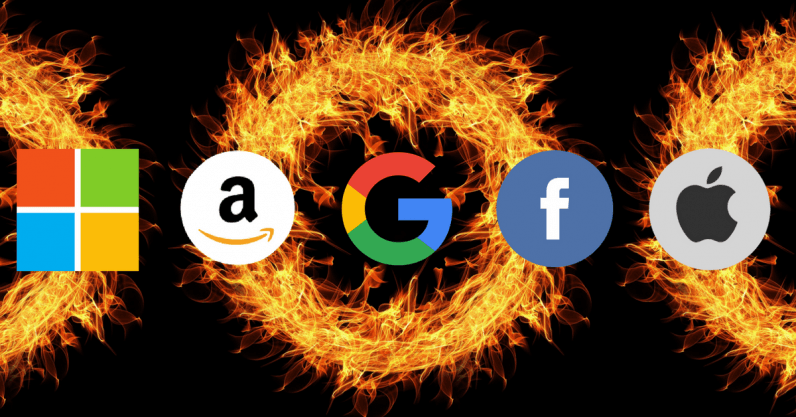 Welcome to the FAMGA (Facebook, Apple, Microsoft, Google, and Amazon) Republic! We’ll see that the trend started back in 2018, the year that personal assistants really started gaining traction. Amazon’s Echo rapidly surpassed its previous high of 10 million units shipped while embedding it into other devices. At the same time, Google made a serious play for its role in the automated conversational market and Facebook re-launched its chatbot initiatives to expand its reach. Employing the power of their developer community allowed these tech giants to build vast libraries of FAMGA based applications that consumers used endlessly on their phones, in their homes, and in every part of their lives. This is point in time when conversational applications really took off — which many people celebrated — but there was a big question left unanswered: What happens with all this data? When people communicate in a natural and conversational way, they reveal more than just words. Individual preferences, views, opinions, feelings, and inclinations become part of the conversation. It’s like being able to listen in, behind the scenes, to every sales assistant’s conversation and customer support agent’s interaction. You are able to understand people’s intentions, actions, and behaviors — maybe even better than they self do. Chatbots and virtual assistants operate in a very similar format, like a dedicated focus group at your fingertips — comprised of your entire customer base, 24/7, 365 days a year. When you have this insight, you can begin learning about what people want, taking customer interaction to a whole new level — you begin predicting with certainty. For example, all of the insight and knowledge helped FAMGA launch the world’s first truly global bank, using the trusted relationship they had developed between users and tech to become the primary financial interface, relegating regional banks to simple service providers. Additionally, automakers who had once innocently played with FAMGA digital assistants as the voice interface, suddenly found one of the key differentiators in autonomous vehicles and the personality of their vehicles — was now controlled by others. Within a few short years, the global economy became controlled by a handful of corporations. Fortunately for us, this vision isn’t a reality, yet. But it could be. Data ownership in conversational applications is one of the biggest issues facing enterprises that are looking at developing their digital strategies. Positioned in the middle of your app and customer, the technology provider knows everything your users say. The information your customers are providing are all valuable data points that can be used to build closer relationships. The data can pick up on ques and translate what looks like a simple transfer of money from one account to the other to understanding actual customer choices. This helps provide a better understanding of your customers personal actions, such as buying a new refrigerator or going on vacation. At the same time, all of these opportunities to better understand your customer are lost. Customers are providing us with more information about their personal lives which could give us value to building closer relationships but we’re losing them — all while FAMGA is well on its way to building its new country. The winner of the chatbot conversation won’t necessarily be the one with the smartest conversation. Instead, it will be the one holding the data at the end of the conversation. Lose that, and you might as well give up now.